Strictly Come Dancing stars Natalie Lowe and Ian Waite delighted the audience in Peterborough for 2015 Strictly Dance Fever in aid of the NSPCC. 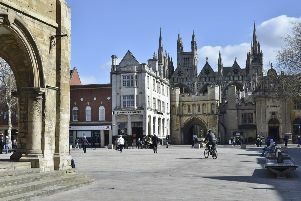 The event, organised by the Peterborough Business Support Group of the national charity, raised in excess of £21,000 from ticket sales, auction and raffle. “The event was sold out within a week of tickets going on sale. Chris Collier, the group’s chairman, said: “ It is proving to be one of the hottest tickets in town. The event was hosted by BBC Radio 4 presenter Paddy O’Connell and there was entertainment from Take to the Stage, who sang a number of Saturday Night Fever numbers. It’s the second year running Natalie Lowe and Ian Waite have performed at this event. Natalie has spent quite a bit of time in this area training the Strictly People’s champion Cassidy Little from Market Deeping. Ian Waite said: “This is undoubtedly one of our favourite engagements of the year here in Peterborough. “Everyone is so generous, appreciative and welcoming to us. This is undoubtedly one of our favourite engagements of the year here in Peterborough. The Peterborough Business Support Group has now raised approaching £700,000 to help fund the work of the local NSPCC service centre over the last 18 years.